My mom is coming here for Christmas, which I'm very excited about. We've been planning our menu, which will be served on my tiny dining room table on Christmas Eve. 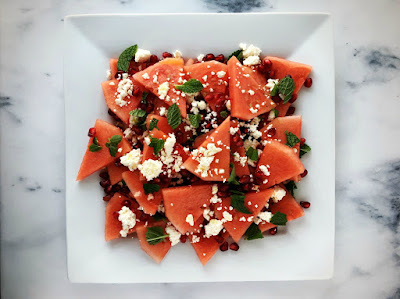 I already know that this beautiful watermelon salad will be on it. I mean. Just look at it! 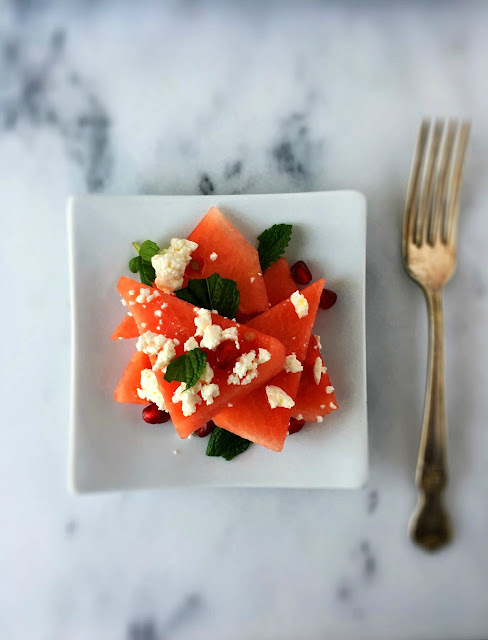 It's so pretty, with the springs of mint, crumbled feta, and pops of pomegranate. Watermelon is fabulous to eat year-round, not just in the summer. 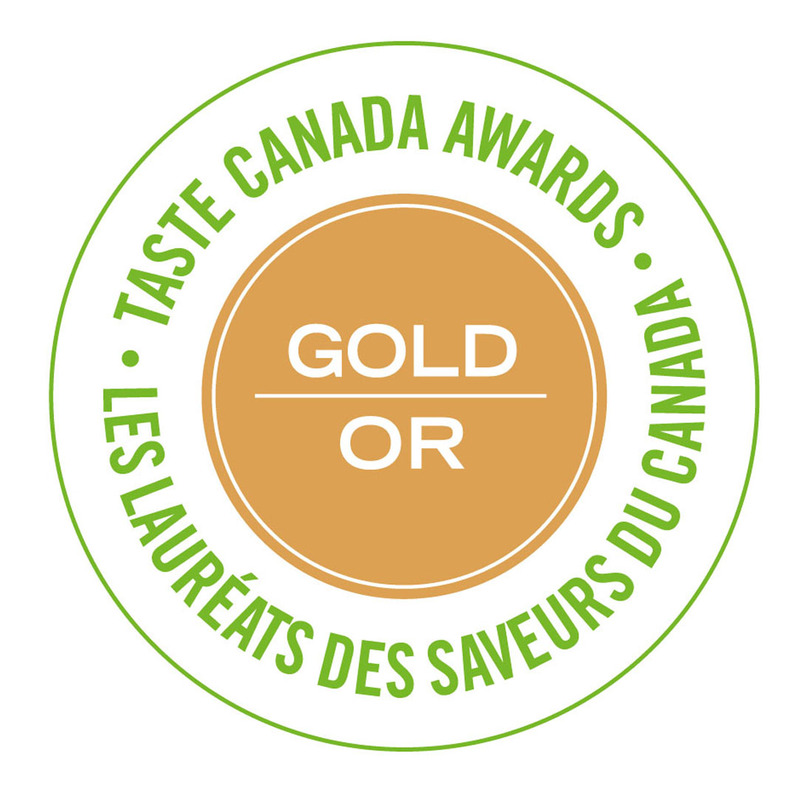 I like eating it in winter, because it just reminds me of warmer temps and those times when the cold didn't hurt my face like it does now in Saskatoon. Watermelon might cost more in the winter, but you can serve a lot of people with one watermelon, so it does offer really good value. And it reminds us of summer! 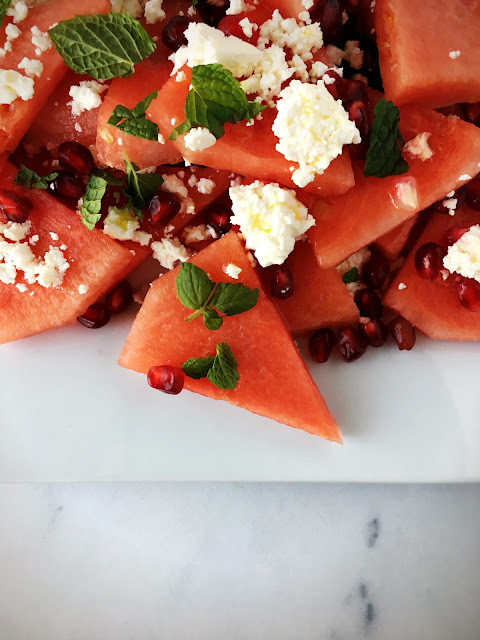 Watermelon really does pair well with savoury items like salty, creamy feta cheese, and the bright acidity of lime juice. If you've never tried it before, it might seem weird, but believe me, it's a nice change. Sweet, and salty are best friends, remember? Watermelon's versatility is an admirable quality, as are its health benefits. High in lycopene and Vitamin C, I don't feel remotely guilty if I take a second helping of this salad. Helping myself to yet another chunk of Toblerone....that's another story! This fun and festive salad literally takes under 10 minutes to make. 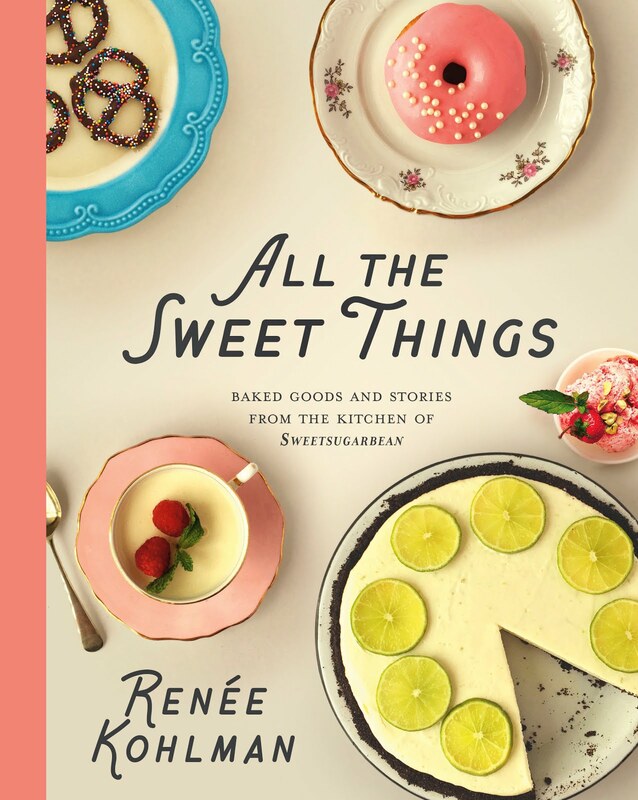 Find a pretty platter. Cut the watermelon into triangles, or cubes if you like. 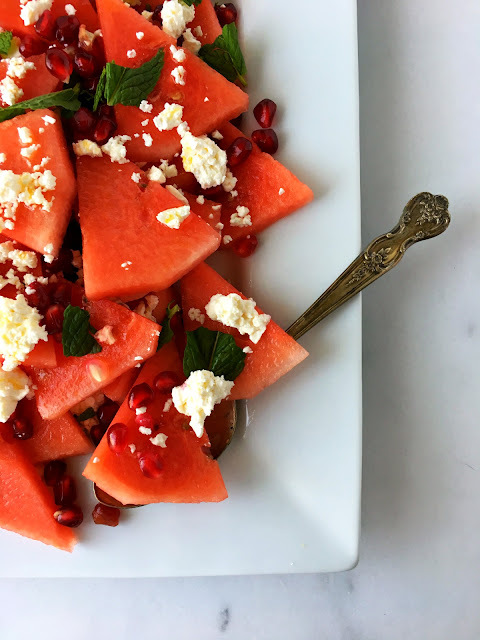 Layer in the pomegranate seeds, crumble some good feta and toss on some sprigs of mint. Give a good squeeze of fresh lime juice and a drizzle of a nice tasting olive oil. That. Is. All. I really love that this salad is so light, in a season where the food tends to be on the heavier side. I love that stuff too, but sometimes you need a break. We can't live on turkey and gravy for the entire holiday season! Watermelon adds flavour and texture to this salad with just a few calories - only 46 calories in a one cup serving. Um, that's like nothing. 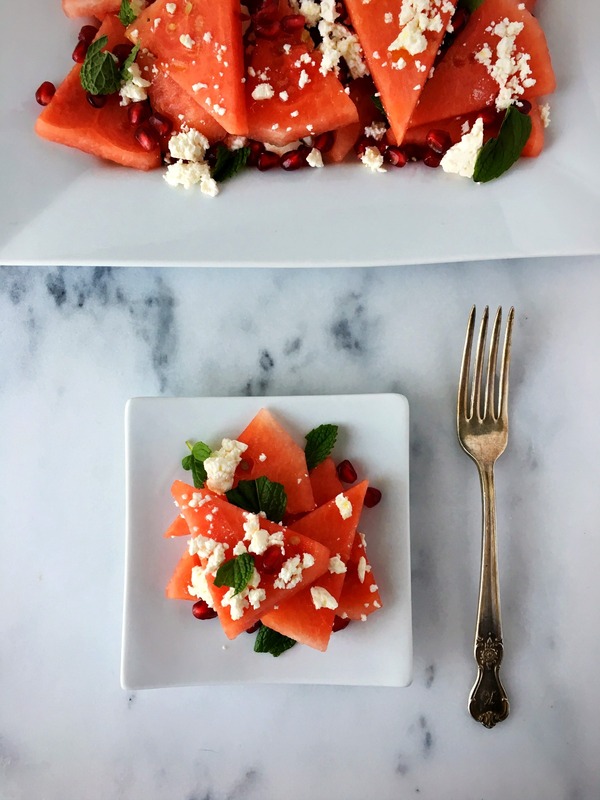 In the season of gluttony, this festive watermelon salad adds a little balance, and I know I can use that. For other ideas on how to eat watermelon this winter, head to watermelon.org for more recipes and useful info! Slice the watermelon in half lengthwise. Peel it with a serrated knife. Cut it into quarters, then slice each quarter into triangles. Or you can cube it, if you like. Arrange half of the watermelon slices on a pretty platter. Scatter on half of the pomegranate seeds, feta and mint. Squeeze half of the lime over it all. 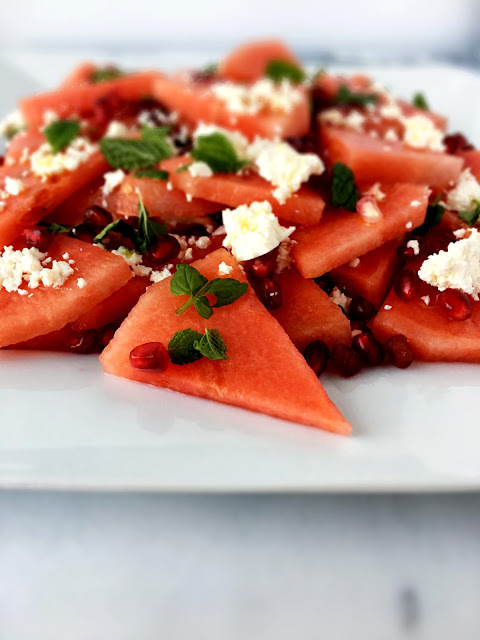 Repeat with the remaining watermelon slices, pomegranate seeds, feta and mint. Squeeze the remaining lime juice over and give a good drizzle of olive oil. Serve immediately. Makes 4 servings.